Check the page set up on your browser to make sure it prints text as black – NOT! Here's an easy, blatant example of a web site with a built in problem, that the owner acknowledges but who has decided to make it the user's problem. I picked up a parking ticket the other day and just went to pay the fine. 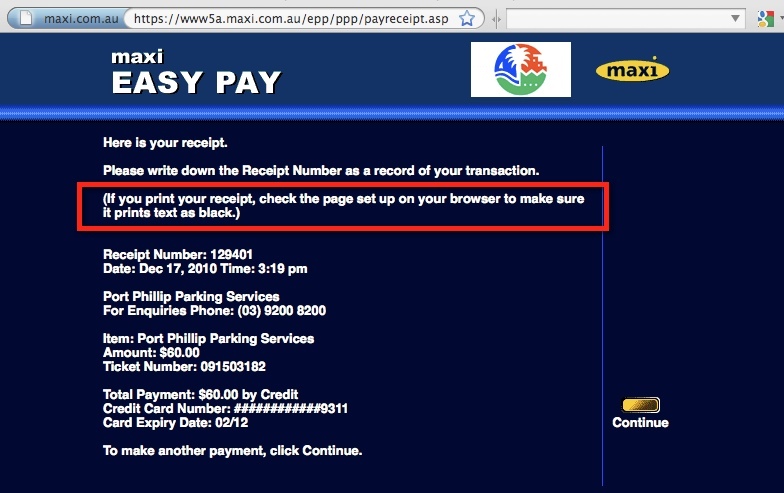 It was with the City of Port Phillip, which like a bunch of councils around Melbourne uses the maxi.com.au online payment system (I remember Maxi launching years ago amidst much hullabaloo, ideas like terminals all over the city etc etc. Nowadays it still exists but only for these small irritating payments). So of course, red rag to a bull, I clicked the print button, yup, an entire page of dark blue background plus the white text. They KNOW it's a problem, but they put it onto the user to solve the problem. Hands up everyone who knows how to change the page set up on their browser so that it would reverse or otherwise deal with this ludicrous situation? I do this for a living and I'd probably fiddle for 5 minutes. Yet the issue is so incredibly simple to fix – just change the styling on the page to a white background and dark text. In fact, I'm positive the last time I used Maxi this issue didn't exist – which means they've updated the site and created a new problem. This entry was posted in Programming, Web Development by David Eedle. Bookmark the permalink.